I started reading Starlord for the second time with issue one back in September of last year. After going on to read every issue of Starlord for a second time (I read them for the first time when they were first published, back in late 1978) it might seem like my nostalgia trip is over, but that is very far from the truth. In fact it has only just begun. This is because Starlord didn’t really die after being canceled. 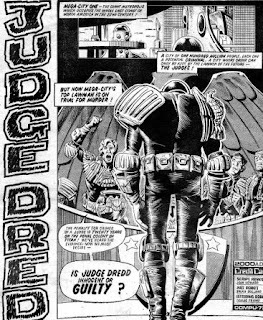 Its most popular strips were moved to another comic, 2000 AD, and its name was added to the 2000 AD masthead in prog 86 of that title. 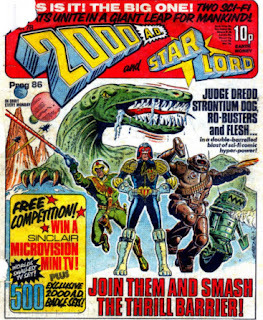 When Starlord finished, back in the late 70s, I transferred to 2000 AD and continued reading it for years, off and on. So that is what I am going to do again, I’m going to turn my attention to 2000 AD, and continue reading. 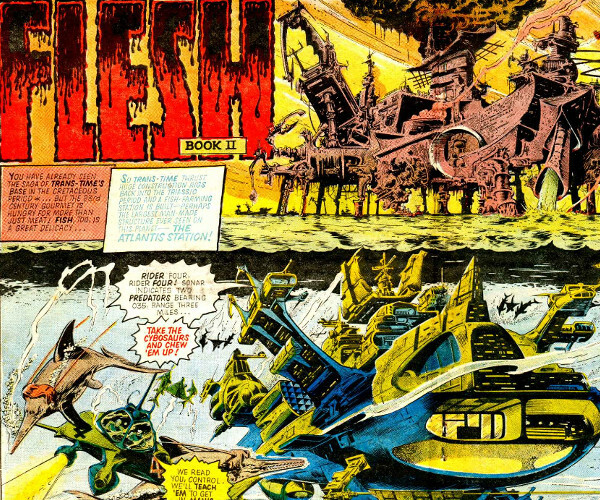 Reading comics published forty years ago is not such an unusual pastime, and 2000 AD attracts more attention than possibly any other vintage comic book. 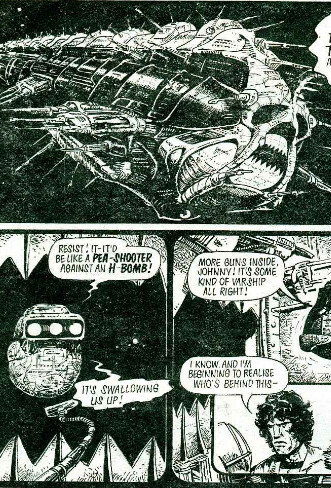 There is even a special name for reading issues of 2000 Ad from yesteryear, and that is “doing a prog slog”. I found some scans of early 2000 ADs that have been turned into CBR files, which is even better because I can read them offline. I installed Bubble, the open source comic book reader (no adds, yay!) on my phone and loaded in the CBR file of issue 86. Magical, I was again looking at the cover of the comic that I saw for the first time in a newsagents forty years before. To be honest, it’s not a great cover, more of an advertisement for the comic itself than a cover for the comic, but seeing it again after so much time is still powerful. Judge Dredd is in the center, the star, but he is flanked by Starlord characters. Judge Dredd is the first strip in the comic, and the strip sees Dredd accused of murder. The punishment is being sent to the penal colony on titan. Strangely he is wearing his uniform, even though he is now a criminal. The art for this strip is by Brian Boland, a giant of comics that never worked on Starlord, and it is lovely. There is detail, and shading, so much lovely shading. Ro-Busters is next, and it is drawn by Dave Gibbons. Strangely, a minor character called Chatterbox gets top-billing along with Hammerstein and Ro-Jaws on the title page. But it is a very impressive title page. 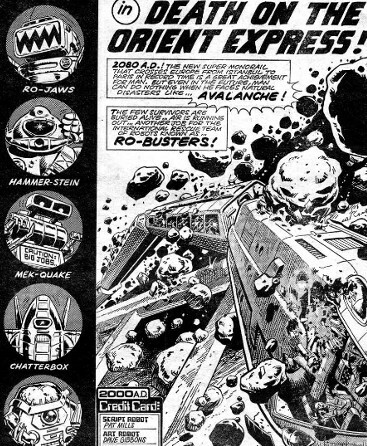 For a 2000 AD reader being introduced to the Ro-Busters for the first time, this should definitely get them interested. The very first frame of the strip is a monorail disaster, nicely drawn with train carriages plumetting to disaster. This is followed by a couple of panels highlighted as “data for our new readers” where we are introduces to the two robot heroes of the strip, Ro-Jaws and Hammerstein. Then we see Howard Quartz, Mr Ten Percent buying the robots cheep. 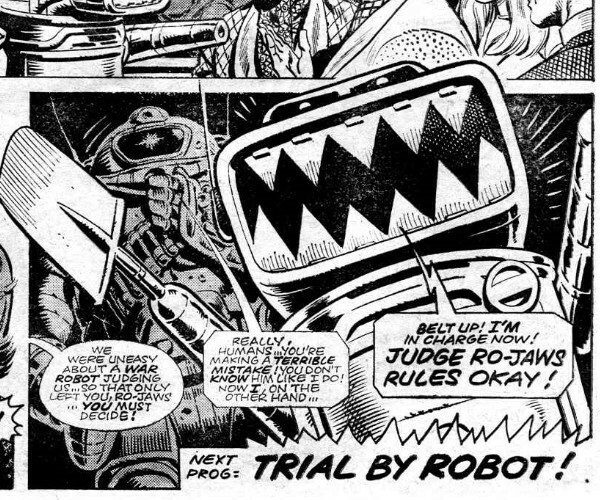 The banter of the two robots is a lot of fun to read again, like when Hammerstein complains that Ro-Jaws is always talking about sewage, and the little green robot with the big teeth replies that he loves sewage, and that he can’t help his programming. This is a great story, though the premise that with nine oxygen cylinders, the ten survivors of the crash can’t all be saved seems to be full of holes. What we do get though, makes up for little problems like this. For example we get a great scene of robots playing cards in the train’s luggage compartment. The robots are detailed designs and have personalities, and for a single frame in a comic book, I think it counts as an astonishing work of art. 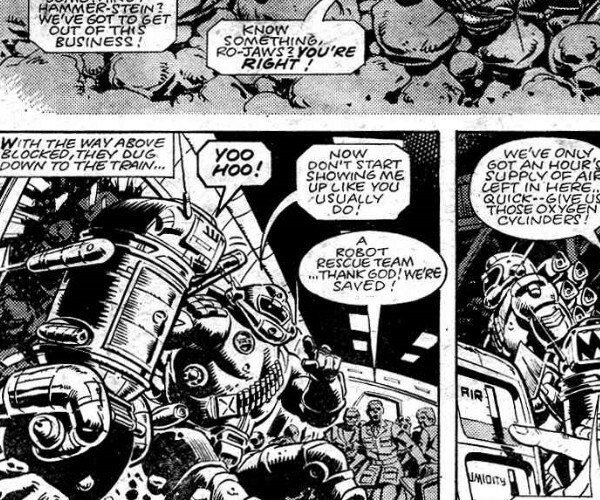 The draftsmanship of Dave Gibbons is a little static sometimes, but it works very well for robots, less so for humans, but perfect for the droids. There is so much personality here, so many funny little moments, like Ro-Jaws remarking how strange it is that one of the robots from the storage area is wearing clothes and Hammerstein reminding him he wore drag a few issues ago. 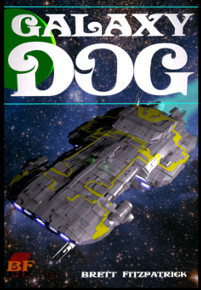 The humans can’t decide who is going to sacrifice their life, which is where we get that annoying plot hole again of not enough oxygen bottles to go around, but I can forgive it because it leads the humans to decide they need a logical, dispassionate robot to make the decision - and they choose Ro-Jaws. I can’t wait till next week to find out how that works out for them. After Ro-Busters comes a time travel story, which I am often not a big fan of, but this concept is so out there that I love it. Humanity of the 23rd century has discovered time travel, and the use they decide to put it to is going back to what the strip calls “the dinosaur age,” to hunt prehistoric animals for food. It’s a great, left-field concept and I’m all in. It starts with a lively, color, double-page spread - the first dash of color in this week’s issue, so it is already packing a punch before it has even started. And there is plenty of action because, in the great tradition of bloodthirsty comics for kids, the dinosaurs don’t waste any time in developing a liking for the taste of human flesh. The strip is drawn by Belardinelli, and I’m in two minds about his work. His dinosaurs are often excellent, but the technology he draws is not to my taste. There is a crane in this episode that looks more like a flying buttress. It is just put together wrong for lifting, and things like that bother me. Also his imagination can sometimes run away with him. I can get past it though, and he’s a good choice for Flesh. I was expecting to do a lot of smirking at the dinosaurs science here, but they talk of a furry tyrannosaurus, which seems surprising to me from a comic published in 1978, could they be talking about protofeathers? Did anyone even know that protofeathers existed back then? They certainly don’t seem to care about drawing the right number of teeth in the tyrannosaur’s mouth, so maybe it was just a flight of imagination that hit on something. 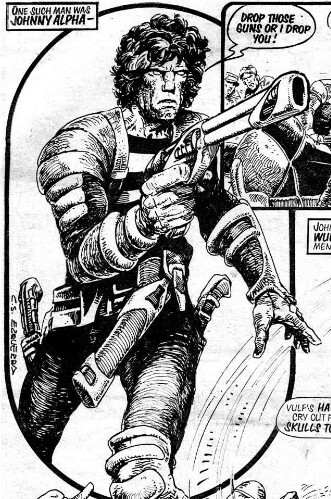 Next comes Strontium Dog, and the readers of 2000 AD are introduced to the character here. 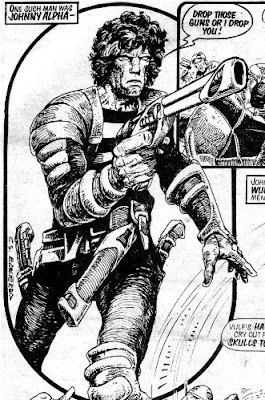 The world of Strontium Dog is quickly outlined, then Johnny Alpha is introduced, in a single panel, the art doing all the talking. We see a drawing that is vintage Ezquerra, showing his exaggerated and organic vision of the future. Johnny Alpha’s gun is as big as a civil war blunderbuss, but it’s futuristic at the same time. This is all economically done in a page and a half, and then the story hits gear. Ezquerra’s spaceships are particularly well designed for this story. We see an astroliner that is not designed to look awesome or impressive, jut a believable, workaday spaceship. This ship is then attacked by a much larger, much more impressive spaceship, that looks like the skeletal ghost of a caterpillar, but with laser cannon stuck all over it. I remember I loved that spaceship back in 1978, and spent many afternoons trying to build it out of Lego. We also see a great panel where Johnny is relaxing with his sidekick Wulf, who is taking bites out of some hunk of food, while Johnny reads what looks like a 1978 version of an iPad. And that’s it. The prog slog has really begun now that I have swapped from the issues of Starlord to the progs of 2000 AD. This is a golden age for this comic, and I can’t wait to see again what I know is coming in later issues, with so much great art and great stories, and with a big helping of nostalgia.